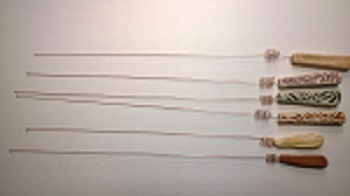 Each Dowsing Rod is unique as you can see from the picture. To ensure you get the Rod that you like best, call Doug at 210.494.8633 and he will send you pictures of the ones on hand from your description of what you like. Included will be instructions of the use of the Rod and Doug will also verbally go over the instructions so you can use it properly. Remember you are only limited by your imagination on the use of this Rod. You can neutralize energy, increase or direct energy, raise or lower the frequency of energy with simple instructions while holding the Rod. You can have answers to Yes and No questions or even ask questions that involve numbers. You can even outline a person's aura with this Dowsing Rod. Wholesale inquires welcomed!